We are a locally owned and operated, outdoor power experts, located in Gisborne, FIRST CITY TO SEE THE SUN. Owners, Gavin and Lisa Hill took over the business in October 2015. 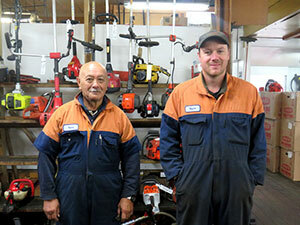 We are proud to be sole Husqvarna dealers in Gisborne. This is a fantastic company to be part of and we have a great deal of respect for the quality of products that they produce. 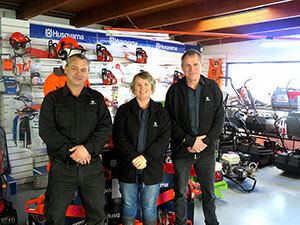 Husqvarna also offer a strong back up to their products and services, for their customers. Gav’s 13 years of experience in the hire industry, where he was the Branch Manager for more than 7 years at Hire Pool has also been a huge advantage in taking over this business. He has a solid understanding in many areas of equipment and knows a fantastic brand when he sees one. At Chainsaw and Mower Services we repair and service all brands….. Husqvarna, Stihl, Shindaiwa, Homelite, bring any brand in, we are more than happy to help where ever we can. Chainsaw and Mower Services also specialise in servicing the farming and commercial industry with a full range of products including Chainsaw bars, chains and accessories, safety clothing, scrub bars, ride on lawn mowers, lawn mowers, log splitters, water blasters and the list goes on. Chainsaw and Mower Services also sell and service Rover Push Mowers, (which we are also the sole agents of) Lawn Master Chippers and Briggs & Stratton Generators.